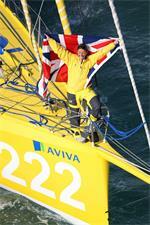 Pictures of Dee Caffari training at sea on board her IMOCA Open 60 "AVIVA". The Lizard. UK All pictures must be credited "Lloyd Images"
The Owen Clarke designed Open 60 has convincingly broken the outright non-stop monohull record around the British Isles. The all girl crew consisted of skipper Dee Caffari, fellow Vendee sailor Samantha Davies, Miranda Merron and Alex Sizer. “We crossed the finish line at 0840 and 29 seconds - after several short tacks between St Catherine’s Point and the finish line off Ventnor - in keeping with what has been a fairly physical race, it was fitting to finish with some high energy tacks! We have been told that the new record time is 6 days 11 hours 30 minutes 53 seconds. We have beaten the previous record by 17 hours 16 minutes. Note to Ed: Previous official record was held by the Open 60 Solune, the unofficial record held by the Volvo 70 Team Russia has also been broken. Dee Caffari and her all female crew aboard Aviva have the record for sailing around Britain and Ireland firmly in their sights as they passed the Scilly Isles this morning. With just 218 miles to go and although the crew anticipate variable winds as they enter the English Channel today, they are still on track to reach the finish line before 0100hrs Tuesday morning. Entering the English Channel will also mean a return to dodging shipping, lobster post and the effects of land and tides will be a constant over the next 24 hours or more. "We will have good breeze for the next 3 hours and then it is going to become more variable, so we are expecting a bit of a slow down as we enter the English Channel. We are also back to the tidal and land effects as we dodge shipping on our way to the finish line. We are all far too superstitious to say whether we think we are going to beat the record but are giving it our all and spirits are high." Although the girls were not prepared to comment, the Aviva Ocean Racing shore team calculated their finish time to be anytime between 0600 and 0800hrs Monday morning. At 0800 hrs (BST) this morning, Caffari and her all female crew were passing the Isles of Scilly.